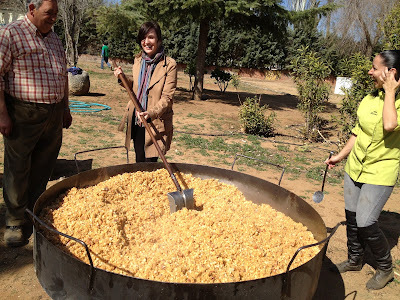 So Migas is a typical dish from the region of Spain that I currently live in which is Castilla-La Mancha. "La Mancha" translates to "splotch", like that splotch of ink that got on your shirt. It got its name because that's the shape that the region makes on a political map. Creative Spaniards, I know. Anyway, Migas is a dish with the main ingredients being breadcrumbs and oil. It originated back in the day when times were hard and families only had bread and oil to eat. But these days people serve it in a variety of ways...with a egg sunny side up on top, or with with lots of fruit, but mostly with meat. In my picture I'm stirring tons of Migas (bread, oil and sausage) for my school's picnic. It fed over 200 people...but not me cause I'm as vegetarian as Little Foot! I love this picture because we're all laughing.